It must be a combination of a busy work schedule and a slow weather pattern. But whatever the actual reason, somehow time has just flown by and all of a sudden it’s almost May! It feels like just the other day I was writing a post about how my favorite month is actually April, since you still have the whole month of May in front of you. Now here we are and April is almost over. I mention May with such gusto because it’s the climatological peak in the southern plains tornado season. And most storm chasers are well aware that there are usually good tornado setups during some part of May. That’s why every year hundreds to perhaps over a thousand storm chasers from across the U.S. and from around the world have been waiting for the month of May to begin. Of course the same number or more storm chasers wait until June to take their storm chasing vacation. But that’s the topic for another discussion. So right now is the time when all the preparation is basically done. Storm chasers have their camera equipment, gps/maps, laptops and vehicles all set for storm chasing. Some plan their trips well in advance, and some wait until the weather pattern is favorable for significant severe weather events until taking their trip. Unfortunately for a lot chasers, especially the ones overseas, taking a chasing trip on the fly isn’t practical. Thus, many chasers have to kinda roll the dice and plan their trip out months in advance. And that’s why a lot of chasers from all over the world choose their storm chasing vacation during the month of May, because it is the climatological peak in the southern plains tornado season. Essentially, they are playing the odds. So here we are. It’s only a few days before the start of May and the tornado season has been and continues to be very, very slow. Forecasts for the next several days don’t really bring much hope or excitement to the upcoming season. We had a very cold late winter that didn’t want to let go in March. Things quickly turned around in Mid April, but too much of mother nature’s grip from winter held on and the severe weather setups that unfolded had significant issues with both the CAP as well a bit too much cold front involvement. Basically, it just wasn’t meant to be. Unfortunately, the weather pattern continues to be stubborn. We’ll call it the high latitude blocking ‘hangover effect’ from late winter, but whatever phrase or word you want to use, it just doesn’t want to let go. Not yet. Sorry, not today, and not anytime soon. It’s partly due to the MJO (Madden Julian Oscillation) returning to the wrong side of the northern hemisphere, coupled with a Pacific pattern that favors a ridge over western North America. Any systems that break through the ridge are forced under another blocking ridge over eastern Canada, bringing troughs to the Southeastern U.S. In essence, the pattern we are headed towards over the coming weeks does not look great for active severe weather events or tornadoes across the Great Plains of the U.S. It doesn’t mean nothing will happen, because the atmosphere — even in terrible chase patterns — almost always finds a way to produce supercells and at least a few tornadoes during the month of May. But it certainly appears that mother nature has other things on her mind for May besides tornadoes. Perhaps she’s more interested in drought recovery through heavy rain events instead of supercells and tornadoes? From that angle, things could be much worse. So where do we go from here? I mean what usually happens when the peak month for tornadoes is, for lack of a better word, a dud? Well in some of the worst years on record the season never really picked up, it just sorta never got going. Sometimes a ridge just expands and summer sets in by June, and there are not many significant severe weather events during the season. Ok, you can step away from the ledge and relax! Take a deep breath. This year doesn’t seem quite like that, at least not yet. It doesn’t look good, but we’re not to the point where we need to start waiving a white flag or anything like that. There is hope, and it has my full undivided attention. I’ve been watching the sea surface temperature trends across the Pacific and have found some interesting similarities to recent years. While I don’t think this season is going to be good at all as whole, it’s far too early to write off as a complete dud. We may be headed towards a summer where El Nino tries to develop. Sometimes when this occurs the MJO steps up to the plate and brings a large extension to the Pacific jet stream all the way to North America. It doesn’t happen for very long and it only happens as a sorta transition from the spring to the summer pattern. But when it does occur, it can bring with it a period (a week or two) of significant severe weather outbreaks including tornadoes to the Great Plains and central U.S. Shelf cloud in Greensburg, PA.
Local, on the fly chases are a lot of fun. They are simple and relatively stress-free. And success is pretty much a given since you weren’t really expecting to chase, so you’re expectations from the beginning are near zero. So as long as you see anything cool at all, the day was a success and everything is good! I left work today knowing there were some pretty weak thunderstorms heading in my direction along the cold front. I was essentially expecting to see a dark sky followed by heavy rain, drive through it and call it a day. Instead, I was greeted by a decent looking shelf cloud — especially for western PA standards for anything forming along a cold front. Now you’ll have to excuse the foreground buildings such as JCPenney and Best Buy. The only decent shot I had of seeing this shelf cloud at all without numerous obstructions was at the local mall parking lot! And yes, I got numerous stares and finger pointing from shoppers and motorists. I mean seriously, I guy can’t take pictures of a thunderstorm? And by the way, people here drive just as bad in the rain as they do in the snow! Shelf cloud and inflow band. You can see the rain shaft on the left and the shelf cloud on the right. Once this storm moved off to my northeast, I dove south towards another stronger cell. Upon reaching my new target I did see a nice lowered base. Unfortunately with the hills and increasing traffic I wasn’t able to get a clear shot of it before getting hit by the core of the storm. But it was a fun local chase to say the least. And I know it sounds kinda silly to get a kick out of a mediocre shelf cloud. And if this was a chase day in the Great Plains at the peak of tornado season, then yes, I WOULD be disappointed. But I had zero expectations going into this and simply had an enjoyable afternoon documenting a shelf cloud in my local area. No harm in that! The first active severe weather period for April has come and gone. This period, which was Sunday through Thursday of this week (April 14-18), had been poking it’s head above water well in advance. So it seemed likely more than a week in advance that a series of potential severe weather events would unfold across the Great Plains and central U.S. But of course the details were in question, and it’s those details that often times dictate whether or not a severe weather setup will be capable of producing numerous tornadoes. During the first three setups (Sunday through Tuesday), a strong CAP located near the 850mb pressure level was likely the main reason for the limited to no supercell thunderstorm formation. 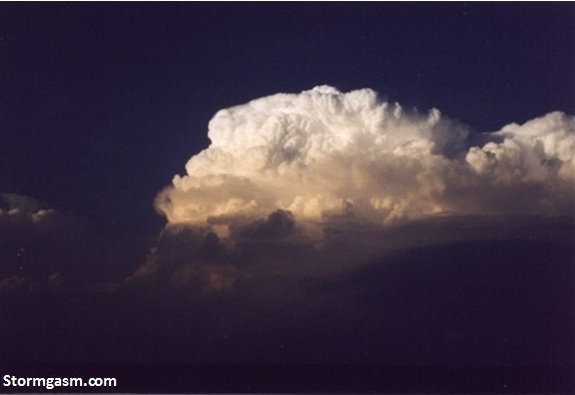 When supercells did form, they struggled with the CAP. This wasn’t too surprising with the lack of good large scale forcing to cool the mid level temperatures sufficiently. In other words, lift from strong jet stream winds associated with main storm system out west hadn’t quite made it out the plains just yet. What is interesting is the events from both Wednesday and Thursday both had very similar issues. 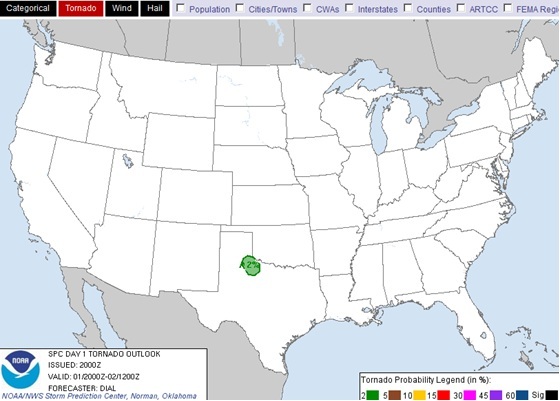 Wednesday was advertised as a potentially significant severe weather day across Oklahoma and surrounding areas. Supercells indeed fired and sustained themselves all afternoon into the evening across southwestern Oklahoma. But at first glance one should have been scratching their head at the lack of more significant tornado reports from those supercells given the high levels of low level wind shear coupled with ample instability. But once you investigate the mid level temperatures, you see what the problem actually was. 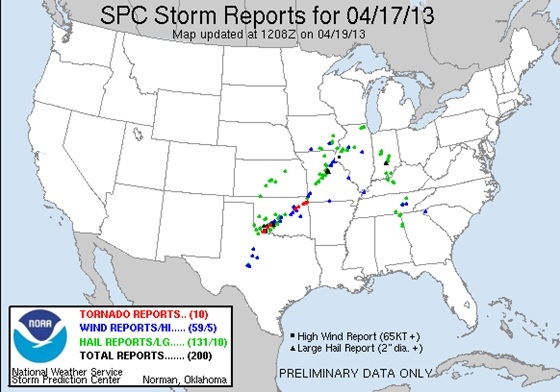 Storm reports from April 17, 2013. Below are two soundings from 00z April 18 (7pm local time). The first is from Dallas, Texas. Notice the inversion (warm layer) located around the 675mb level. A CAP located that high in the mid levels causes thunderstorm updrafts to struggle. The 850mb inversion has been eroded, but it’s that warm layer located much higher up that really causes issues with not only thunderstorm updrafts, but consequently the tornado potential with the thunderstorm. You can also see an inversion from the Norman, Oklahoma sounding (despite the sounding data stopping around 675mb) below. This inversion is likely a contributing factor in the lack of more long track tornadoes produced on Wednesday across southwest Oklahoma. 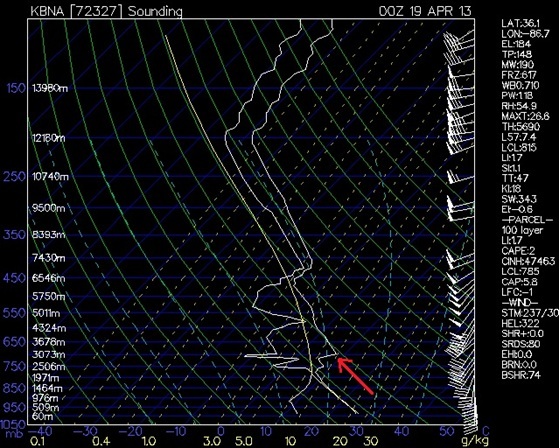 Dallas Fort Worth sounding from 7pm April 17, 2013. Notice the CAP located near the 675mb level. 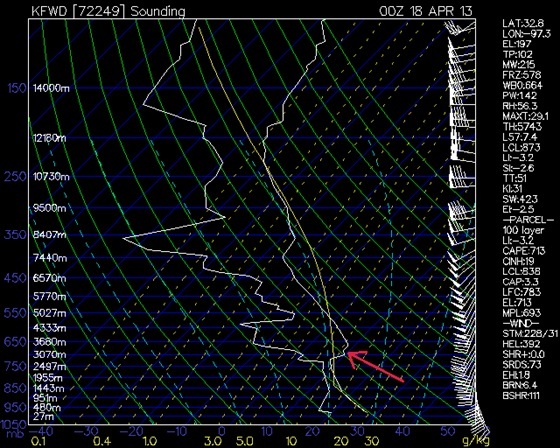 Norman, Oklahoma sounding from 7pm April 17. Notice the CAP located near the 800mb level. Going one step further, this same storm system moved into the Midwest and Tennessee valley areas on Thursday. Wind shear and instability were present along with adequate moisture. 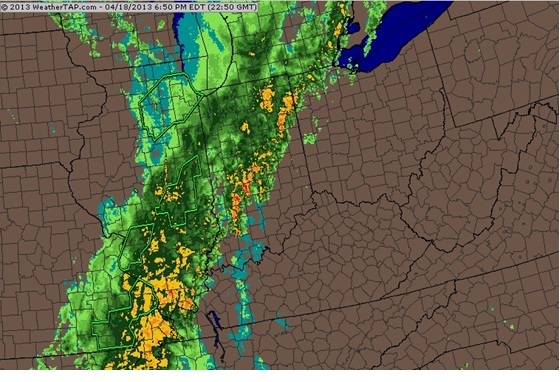 But one problem was a squall line that never dissipated and continued moving east across Missouri, Illinois and Indiana (see image below). Cloud cover ahead of that squall line was another issue, limiting quality surface heating. But those weren’t even the biggest issues. Discrete storms (including supercells) might have had a chance at forming out ahead of that line of thunderstorms had their not been another high level CAP! 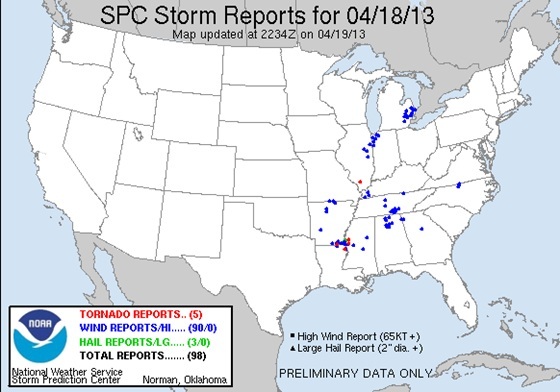 Storm reports from April 18, 2013. Regional radar image from 6:50pm EDT on April 18 over the Midwest/Ohio Valley region. 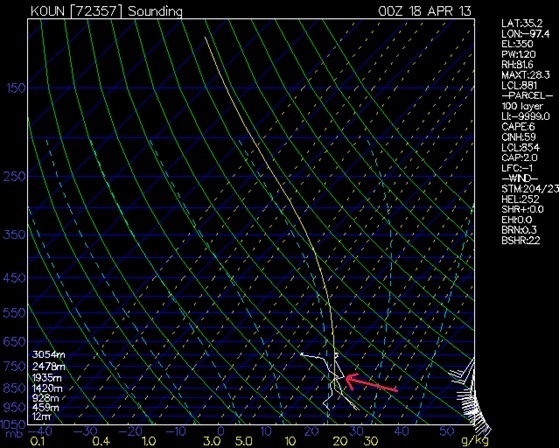 Below is the 00z April 19 (7pm Thursday) sounding from Nashville, Tennessee. Notice the CAP located at 675mb, the same level the inversion was located on the Dallas sounding from the previous day. Also look at the Indianapolis sounding from Thursday morning. While not as pronounced you can still see an inversion near the 675mb layer. Nashville sounding at 7pm on April 18. 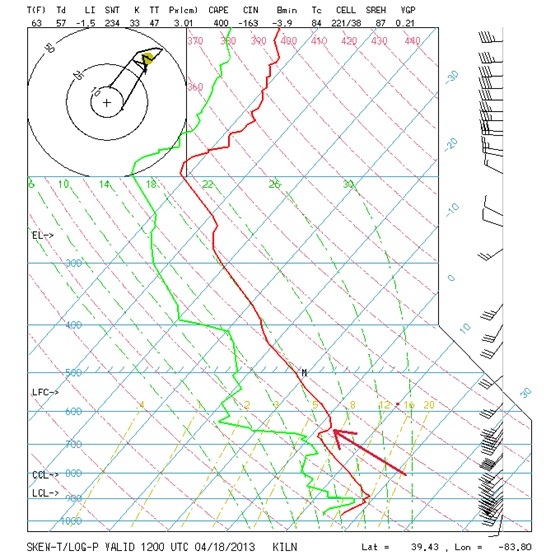 Notice the inversion at the 675mb layer, the same level where the inversion was located on the Dallas Fort Worth sounding from the previous day. Indianapolis, Indiana sounding from 7am on April 18. Notice the inversion located at 675mb. So what is going on here? I mean, a big storm system moved into the central U.S. during the week. 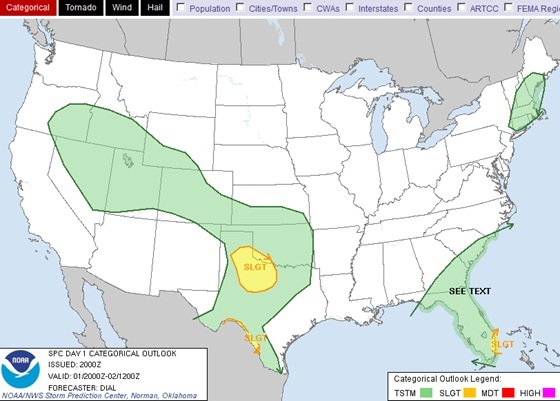 For three days in advance of that system there were severe weather setups that were ultimately destroyed by the CAP. That’s not too unusual, especially early in the season when sometimes low level moisture and especially cloud cover can be a major inhibiting factor. But for both days — when the main storm system was involved — to be completely underperformed due to continued capping inversion issues? This is not good. Either this pattern was trashed from the beginning, or something smells bad as head deeper into the storm chasing season. IMO the pattern that evolved coming out of the cold March we had was the issue. So over the next couple weeks or so the weather pattern just needs some time to adjust. The atmospheric ‘hangover’ from historic high latitude blocking needs time to disappear, and spring just needs time to be refreshed. We need a do-over. The other issue that hasn’t gone away is the current drought over the plains states. I believe that was probably a contributing factor to the significant CAP we’ve seen as of late. I’m not sure that issue is necessarily going to be resolved without a fight. Once again I see you’ve met my friend the CAP. He’s been responsible for preventing more widespread storm chasing setups from occurring across the southern plains states as of late. But for a day like Wednesday, April 17, when enough large scale forcing will be in place to weaken our friend and allow for storms to fire, it’s ironic for so many other complicating factors to come into play. And it may not be as widespread of a severe weather event as some might expect for many other reasons not related to the CAP! In fact, it could be a rather messy setup. Then again, should these issues be resolved, I could absolutely envision tornadic supercells occurring. But one step at a time. The computer models we use as tools to predict thunderstorms and it turn, tornadoes, are not agreeing on how far north a cold front will retreat as a warm front on Wednesday across Oklahoma. The current options on the table range from central Oklahoma to the Kansas/Nebraska border. On top of that, there is considerable uncertainty regarding the evolution of the convection leftover from Tuesday night’s activity along that front. There will be a lot of moisture, large scale ascent and other dynamics at play all basically having a traffic jam from along the Red River into Oklahoma and Kansas Wednesday morning. I imagine there will be convective debris in the form of messy thunderstorms/rain and low clouds that could linger well into the day. Until we know how all of this will evolve throughout the day on Wednesday, I’m afraid it may be a bit too soon to get excited about the potential for tornadic supercells, at least for now. I think we need a bit more data. 12z April 15, 2013 WRF model surface dewpoint forecast for Wednesday, April 17 at 7pm CDT. Notice deep moisture only reaches to as far north as central Oklahoma and far east Kansas thanks to the cold front remaining over northern Oklahoma and eastern Kansas. 12z April 15, 2013 GFS surface dewpoint forecast for Wednesday, April 17 at 7pm CDT. Notice how much further north the deep moisture reaches on this model. Lower 60s dewpoints reach into northern Kansas because the cold front has lifted north into southern Nebraska. This is a much different scenario vs. what the WRF model indicates. If that front can lift far enough north and if the convective debris moves out of the warm sector early enough in the day Wednesday, then we can start talking about much more interesting things! In that scenario (essentially the 00z April 15 2013 run of the WRF model, the GFS depicts moreso the messy scenario despite lifting the front far enough north – gotta love computer models ) supercells would likely form off the dryline from western north Texas into Oklahoma and have moderate tornado potential. The atmosphere is one finicky beast! This isn’t news to me or anything. Rather, it’s something I’m reminded of anytime a forecast for a period of severe weather doesn’t quite pan out the way I expect it to. Mother nature requires a certain balance between moisture, instability, wind shear and large scale forcing to produce severe weather setups that can then bring storm chasers supercells and tornadoes. But if one piece of the puzzle doesn’t fit quite right, the whole thing falls apart and you end up with one big mess! So while the large scale weather pattern over the next few days is coming together like I have been anticipating since the late winter, so many of the details are not that the end result may be very disappointing. And yes, the atmosphere is extremely particular about the conditions necessary to bring good storm chasing setups. That statement may be more valid this season than most considering the current drought situation. (Yes, the drought continues over the Great Plains. The CAP has already been a major issue during recent severe weather setups, and it looks like that trend will continue. See images below). 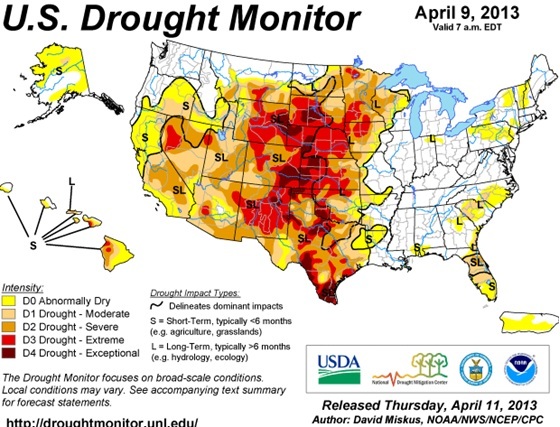 U.S. drought monitor as of April 9, 2013. 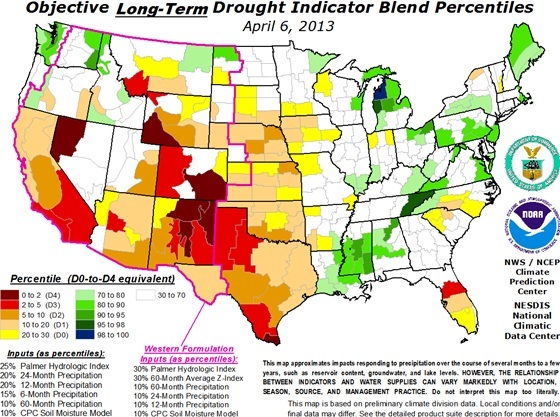 Long-term drought indicator created April 6, 2013. The severe weather setups that will occur Sunday through Wednesday over the Great Plains have a lot working against them. This is especially true for both Sunday and Monday’s setups. Whether it’s forcing along the cold front or a CAP that can’t break due to a lack of large scale lift, neither setup is all that appealing. But once the main trough from out west ejects late Tuesday and finally on Wednesday, I do think there will be a lot more potential. Not only for a more widespread severe weather day, but possibly discrete supercells and tornadoes *IF* the atmosphere – who is one finicky beast – manages to put together all the ingredients in such a way that is acceptable for mother nature. Unfortunately for this storm chaser, a two day severe weather event three days in the future that still holds considerable uncertainty just isn’t enticing enough to make the long drive out to the plains. And it’s a little disappointing, too. Because the odds are with the available moisture and the strength of that trough (system coming out of the western states) that there will be supercells producing tornadoes on one of those days. After this series of severe weather setups, mother nature wants to shut down the shop for a while in the form of a ridge over the western U.S. You can thank the tropical convection over by Indonesia, along with other mechanisms, in helping to bring and sustain this ridge for what looks like potentially a few weeks. 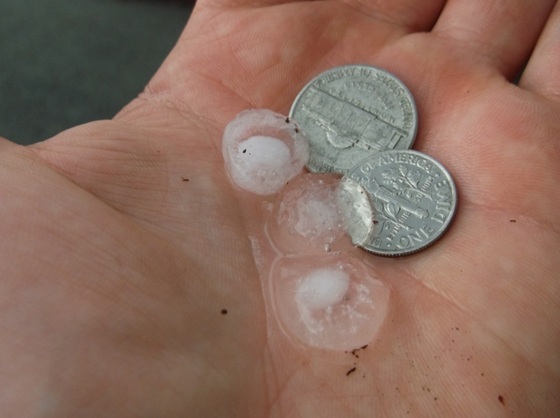 Dime to nickel sized hail at my house. Today I was greeted by a severe thunderstorm. 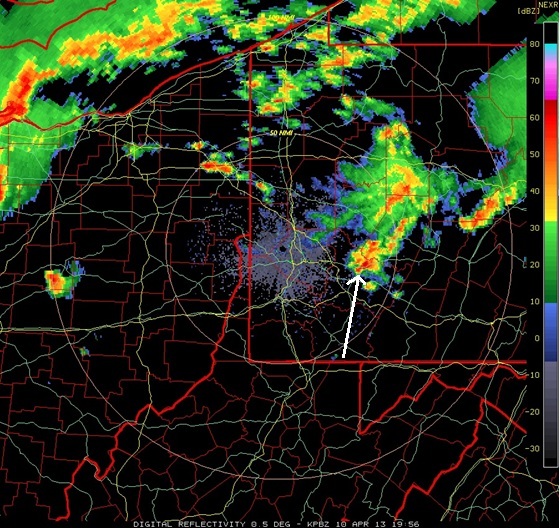 It clearly had supercell characteristics on radar and it passed directly over my house here in western PA! This storm packed a pretty good punch, too. It brought strong downburst winds, dime to nickel sized hail, and at one point it sounded like the windows on one side of the house were going to break from the intense straight-line winds! Being here in Pennsylvania I honestly didn’t think I would need to have the video camera ready. I mean, we do get severe thunderstorms from time to time and I didn’t expect all that much from this one. Well, once those strong straight line winds kicked in I ran for the video camera as the wind nearly took out the windows upstairs! I grabbed it in time to pick up two more very intense downbursts on video, but too bad I didn’t turn off the auto focus! (That’s the default setting anytime you turn on this video camera). By the time I realized it the damage had been done, with a good shot of raindrops on the glass door instead of intense wind video. 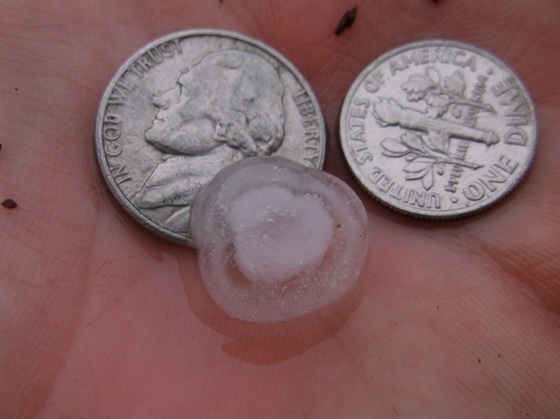 But I did at least get some decent video of the dime to nickel sized hail falling. If nothing else this was an exciting afternoon and it was a good test run for video shooting awareness. Short video clip. Note: Only about a second of the downburst winds are on video in the beginning due to poor filming (auto focus) by yours truly. Hey, cut me some slack, this isn’t tornado video and I wasn’t storm chasing! Another shot of the hail. After the hail stopped falling I went outside to take some pictures. 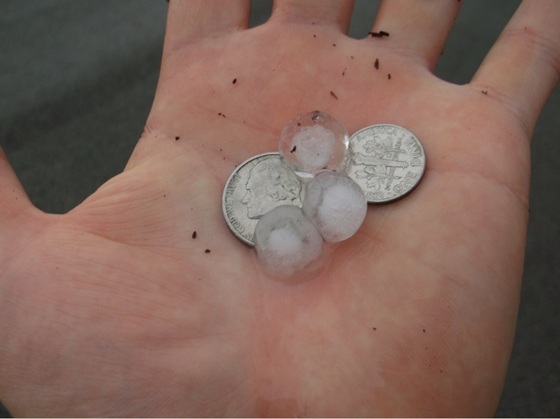 At one point I took a shot holding the hail stone in front of me. Well, right as I snapped the picture a lightning bolt struck off the in distance in front of me! And it turned out that the bolt was literally right behind my finger and thumb in the picture. What are the odds? 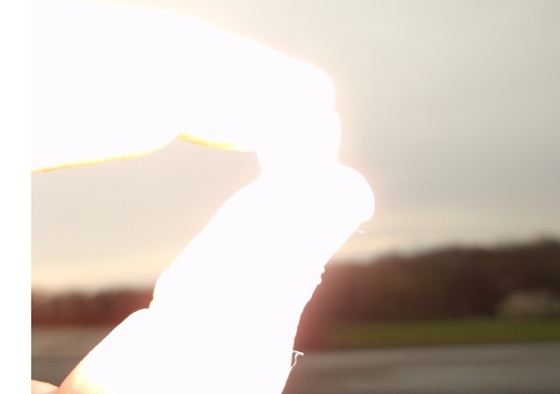 This picture was taken right as a lightning bolt struck off the distance, directly behind my thumb and finger! Yet another shot of the hail. 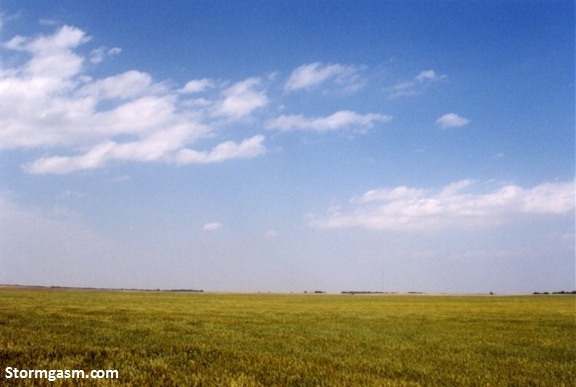 Photo from May 22, 2002 near Dodge City, Kansas. The CAP was just too strong on this day, leaving partly cloudy skies above an open field in western Kansas. The CAP, or capping inversion, is a term storm chasers have given over the years to a very warm layer of air located above the surface in the lower to middle levels of the atmosphere. It holds off thunderstorms from forming until some lift from the dryline, a cold front or some other forcing can break through and maintain sustained convection. In other words, once the CAP breaks, supercells can form and the chase is on. If the CAP doesn’t break, well, better luck next time. I imagine that for tomorrow’s setup (Monday, April 8 ) the CAP will be mentioned quite a bit, but not in a positive sense! The CAP is a double edged sword. You need it to keep storms discrete to have a higher probability of producing tornadoes. At the same time if it’s too strong, then there’s the chance no storm form at all. And trust me, driving out to the middle of Kansas or Oklahoma or wherever to look at towering cumulus clouds all day that amount to nothing isn’t exactly what I consider a fun day. Tomorrow looks like one of those days where the CAP may just be too strong in a lot of areas despite quality low level moisture and very good wind shear for tornadoes ahead of the dryline. Of course if a storm can form along the dryline and sustain itself, then it certainly has tornado potential. Though it seems more likely any storm that does form would struggle with the CAP and have a hard time producing a tornado. But you never know, forcing along the dryline can sometimes surprise us, so there’s always a chance. But there will be large scale forcing focused over eastern Colorado and northwestern Kansas, so that would be an area where storm will be much more likely to form. Plus there will be some help from upslope flow as well, so that’s a plus. Wind shear there will also be favorable for supercells and tornadoes. Though moisture could become a concern, limiting instability. I’m personally not a huge fan of the storm motions projected for that area either. But, it’s definitely an area where storms are much more likely to form and probably holds the highest odds for supercells and potentially tornadoes to occur. Supercell at sunset on April 17, 2002 in far northwestern Oklahoma. April is my favorite month. Not May. Not June. No it’s definitely April. When I was studying for my meteorology degree at the University of Oklahoma back in the day (the years go by faster than you can imagine), I went on so many wonderful storm chases during the month of April. It’s the time of year when quality low level moisture from the Gulf of Mexico usually makes it up to Oklahoma and Kansas, sometimes much further north. And most of the time the jet stream is still quite strong as a leftover from the winter season. So you can imagine that on occasion the right amount of moisture and wind shear would result in some magnificent supercells thunderstorms, and even tornadoes. But the reason why April is hands down my favorite month isn’t just because of the storms that I’ve encountered or the experiences I’ve had. It’s so much more. It’s the fact that even after a chase day in April is over and I’ve seen an incredible supercell that produced baseball sized hail, a tornado, with a spectacular lightning show after dark, I know there are still two MONTHS of the storm chasing season in front of me! 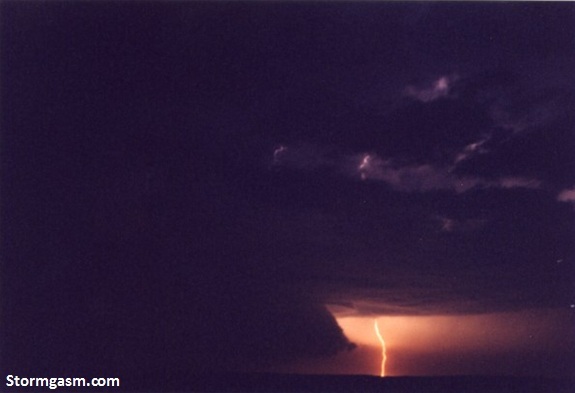 Wall cloud illuminated by lightning from a supercell in extreme southern Kansas on April 17, 2002. Perhaps the most incredible feeling occurs while standing in front of a supercell thunderstorm as the sun is setting. The wall cloud rotates in the distance. You snap a couple more pictures…you zoom in with your video camera. Then you take your eyes away from the view finder for a moment just look at the storm. It’s just you and the storm. You think about the tornado it produced an hour ago and how amazing it was to witness. Then, you think about the chase setups that are coming up over the next few days. Your anticipation grows and a sense of true happiness sets in. But then you think about that fact that it’s only April **, and you know there is much, much more to chase and experience this season. How are you supposed to feel when a severe weather pattern you’ve been forecasting for weeks and weeks finally starts to poke its head out of the water? I feel excited, but also anxious. I mean, being both a storm chaser and a meteorologist, I put everything together that I’ve learned over the years so that I can have a pretty good sense of how the chase season may evolve. For this season I’ve been saying I don’t have high hopes for the typical mid or late May peak for severe weather in the Plains. But what I have been anticipating is FINALLY showing up in earnest in all computer models. That’s right, a series of troughs are forecast by all computer models to dig into the western U.S. and eject into the plains states beginning this weekend through mid next week. One of those setups – namely the one showing up for Monday – certainly has the potential to produce a few tornadoes (seem image below). But a cold front will be moving down the plains behind that system on Tuesday, so that complicates Tuesday’s tornado potential. And on Wednesday that front looks to be well into central Texas, and we’ll have to wait for the next big trough to dig into the Rockies before more significant storm chasing setups will occur. Since I live so far away and work full time, it’s not practical for me to take a chasing trip unless there will be several chase days in a row or a setup looks like a massive tornado outbreak. So I’m forced to look beyond this first series of chase setups. 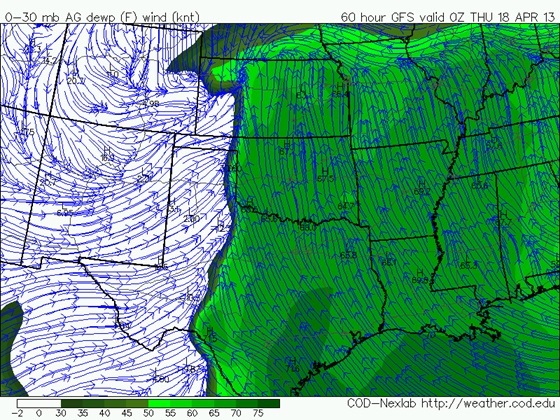 GFS 500mb heights and wind forecast for Monday, April 8 at 7pm CDT. But that’s ok, because this severe weather pattern is just getting started! 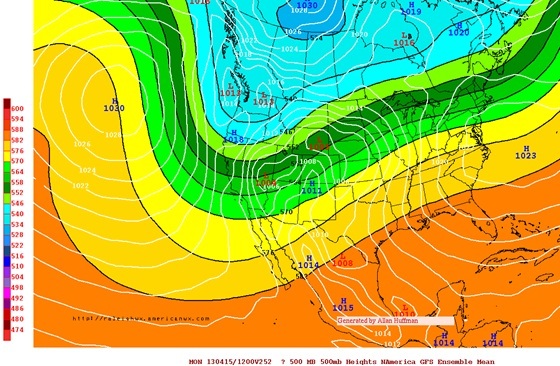 Another big trough is forecast by all models to dig into the western states next weekend (April 13/14). A ridge is also forecast to build over the southern and eastern U.S. 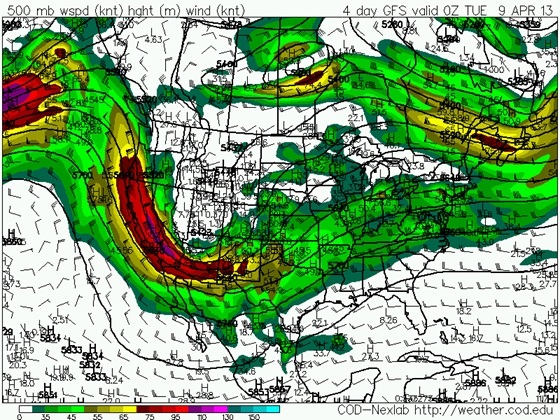 This combination will set the stage for severe weather setups across the plains the week of April 15 (see image below). The only problem is this far in advance I have no way of knowing just how good any of those setups will be. I just have to hope one of them is really good. But I will say the Pacific jet stream is still quite strong thanks to continued La Nina-like Pacific forcing (hangover from the winter) and some help from the MJO. In other words, wind shear should be very strong with the storm systems that dive into the Plains during that week. So the odds are there will probably be some pretty good setups. Knowing these factors and the choices involved, perhaps you understand why I said I feel both excited and anxious! I mean c’mon, this is just one part of the preparation process for storm chasing! I know, you thought I’d say I feel so excited and can’t wait to go chasing and get right up next to a massive wedge tornado! Well, that’s absolutely true. But right now it’s a little stressful having to decide exactly when to go. I live in western Pennsylvania, which is about a twenty hour drive to Wichita, Kansas. I also have a full time job, so I have to consider how many days I want to be out storm chasing, and then factor in the travel time to and from the plains. But it would be cool if I could just just teleport myself to the plains! I am so excited, though! I wait all year for the spring and then pick the time period when I think tornadoes are most likely. I can only take so much vacation time and I also like to save a few days a year for ‘real’ vacation because we all know that storm chasing is not the most relaxing hobby. But this is a really exciting time because before too much longer I will be out in the plains chasing storms, looking for my next tornado! It’s nice to see the month of April begin with a supercell over the Texas panhandle. Today the SPC issued a slight risk for severe thunderstorms as well as one of the smallest tornado risk areas I’ve ever seen them issue! But that may only be because the initiation point coincided well with the best wind shear along the triple point (near the dryline/cold front intersection), owing to a rather small area for tornadoes to occur. Day 1 Convective Outlook from the Storm Prediction Center valid April 1, 2013 2000 UTC. Day 1 Convective Outlook Tornado Probabilty from the Storm Prediction Center valid April 1, 2013 2000UTC. Anyways a nice looking supercell did fire today between Amarillo and Lubbock, TX along the triple point. You can see the supercell in the radar image below. Notice it has a v-notch along with very high reflectivity in the core of the storm. Also note the small hook feature on the southwest side of the reflectivity. I don’t see any tornado reports right now from this storm, but if it’s going to produce, it will be soon based on this radar signature. I also included the echo tops (below) for those who are curious how high the cloud tops are with this storm. At the time the image was saved, the echo tops were around 46,000 feet. That might sound pretty impressive, but during major severe weather outbreaks including significant tornado events, storm tops from massive supercell thunderstorms have been known to reach higher than 60,000 feet! Lubbock, TX radar image (base reflectivity) on April 1, 2013 at 2107 UTC. Lubbock, TX echo tops on April 1, 2013 at 2107 UTC. 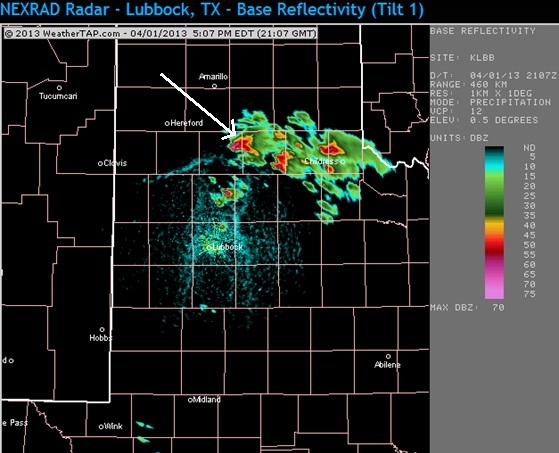 It looks like more storms are forming further to the south, north of Lubbock. Perhaps with time those storm will organize and provide more opportunities for any storm chasers that are out there today! Although with any luck another storm might form further east of the original supercell along the triple point, and that could provide chasers another opportunity out there today.